Bria Jerome has been digging in the garden, so to speak. Make that gardens. As part of her internship at SGA, Bria is mapping all of the school gardens in the state. And there are a lot of them. At last count, she’s dug up more than 600. The Roosevelt University senior learned about SGA internships from a professor. 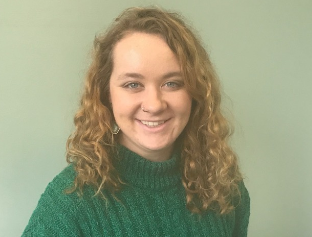 She is spending the winter semester working mostly in one of SGA’s program areas, the Illinois Farm to School Network (IFSN). The network provides training, connects partners, and shares resources about all aspects of farm to school— including local food sourcing, hands-on nutrition education, and school gardening. In applying for the internship, Bria said she was interested in working on a GIS (Geographic Information System) project. The mapping project turned out to be perfect for her because it required her to use a GIS program. The map went liverecently on the IFSN website. Bria actually does have some real gardening experience. Back at her home in St. Peters, Mo., she and her dad have a raised garden bed in which they grow tomatoes and peppers. And they have compost bin, she added. The mapping project gave Bria a real picture of how many school gardens there are throughout Illinois. Her schools in her hometown, she said, didn’t have gardens. During her semester-long internship, Bria also is working with SGA’s zero waste school efforts. She got to help with a school waste audit, which involved setting up waste bins and helping students with the sorting and then weighing how much was collected in each trash bag. In addition to spending two days of the week at SGA, the sustainability and political science major has a full course load of five classes this semester. After she graduates in the spring, Bria, who’s interested in urban planning and government, plan to work with AmeriCorps next year then eventually attend graduate school for urban planning. For SGA intern Abbott Hays, caring for the environment comes naturally. The University of Illinois-Chicago senior grew up helping her parents conduct mussel surveys in the Sangamon River near where they lived. She credits her parents, both political science professors, as big influences her on thinking about environmental issues and impacts. “I grew up with very environmentally minded parents,” Abbott said. “They compost. We live in the woods outside of Champaign, Ill., near a river, so we try to be as sustainable as possible with the place that we live. And we try to co-exist with the environment around us because there’s such a huge eco-system that exists in the [Sangamon] River. “Living near and helping to take care of the river’s health has been “very scientific and really fun,” Abbott said. Abbott began her semester-long internship at SGA in late January. She’s working with Susan Casey, SGA’s Zero Waste Schools program manager. Abbott also has done a few school visits, which she loves, she says. And her design background helps with another assignment: designing poster designs and worksheets that will hang in lunchroom. She also had a chance to sit in on meeting with Susan in Lake County that was about a school wanting to implement a zero waste program.